On An Overgrown Path: Stravinsky - the last great composer? 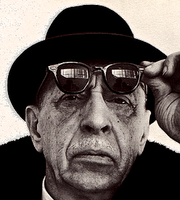 Stravinsky - the last great composer? The composer George Perle observed when Stravinsky died that the world was without a great composer for the first time in six hundred years. It still is. From Michael Kimmelman's review of Stephen Walsh's new book Stravinsky: The Second Exile: France and America, 1934–1971 in the current New York Review of Books. If you enjoyed this post take An Overgrown Path to What exactly is a 'classic'? I can't believe that. Just looking at my CD collection, what about Peteris Vask and Zbigniew Preisner? Not the level of Mozart, but pretty good stuff. What about Hans Zimmer? Howard Shore? If you're a really good composer would you be swetting on some chamber music that will at most be performed for a couple of people in their 50s? If you're a really good composer would you be contend with your government allowance that you will get whatever you produce, or even if you produce the most dreadful stuff, because you're an artist right? And government should take from the people that have (hard working parents) and give it to artists that have nothing to give, right? Nope. If you're good, you would be working in Hollywood or wherever good movies are made these days. I believe you will find the good composers where big money is made. Mozart is doing movie scores right now. Currently listening to Apollo performed by Igor Stravinsky (Sony Classical). Nice thought (and response?) provoking comment Berend. Here to supplement it are some hot links. Some 'near great' still composing composers are certainly Elliott Carter, Hans Werner Henze, and Harrison Birtwistle. No? ... Pliable will no doubt add Sir Malcolm Arnold and the neo-cons will no doubt add Robert Simpson. Robert Simpson, yes. His symphonies are fantastic--the CD with the 6th & 7th is one of my favorites. Of course, he's slightly dead, so he doesn't fit Perle's criteria. I know many wouldn't agree, but I think Boulez is a great composer and he's still alive. Thanks for the correction regarding Robert Simpson, Henry. On Saturday afternoon, I listened to the BBC Proms premiere performances of Jonathan Harvey, James Dillon, and Julian Anderson; and then on Sunday, the Simpson #9 and the Arnold #9 on CD. While I did note that they were both born in 1921, I forgot to check whether they were both alive. I guess I only wished that Simpson were still alive and composing. If you follow this link you will find more than 8 minutes of Robert Simpson's music as downloads, go right to the bottom of the article.